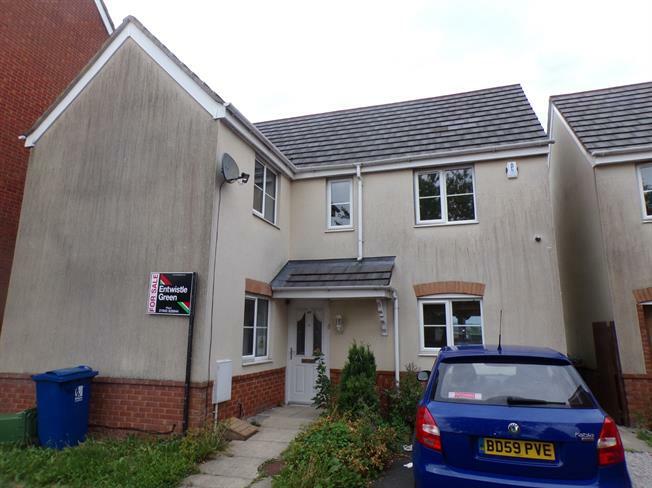 4 Bedroom Detached House For Sale in Wigan for Asking Price £155,000. Coming to the market with no onward chain, Entwistle Green are pleased to offer this modern, four bedroom detached property for sale. Conveniently located close to the Robin Park retail park and Wigan Town Centre, the property is ideal for families. In brief, the property comprises; Entrance hall, Lounge, W/C, Living room, Conservatory, and Kitchen Diner. Upstairs there are four bedrooms as well as a family bathroom. Wooden door, UPVC window unit, ceiling light pendant, linoleum flooring, wall radiator. Ceramic toilet, metal wall handle, ceramic sink unit with pedestal and stainless steel mixer tap. Wooden door, two UPVC sliding doors leading to conservatory, ceiling light pendant, carpeted flooring, two wall radiators, electric fireplace with surround. Wooden door, UPVC double doors leading to garden, UPVC window unit, ceiling light pendants, linoleum flooring, wall radiator. Wall, base and drawer units, built-in oven, hob and extractor hood. Stainless steel sink with mixer tap. UPVC double doors leading to garden, UPVC window units, wall mounted light fixture, tiled flooring. Wooden door, UPVC window units, ceiling light pendants, carpeted flooring, wall radiator. Built-in cupboard with wooden door. Wooden door, UPVC window unit, ceiling light pendant, carpeted flooring, wall radiator. Wooden double doors leading housing storage cupboard.